One of the things I've wanted to do for a long time is ride a century. Today was my day. Every year, the Bonneville Bicycling and Touring Club sponsors the Utah Lake Century Epic Ride or ULCER that goes 111 miles around Utah Lake (a large fresh water lake south of the Great Salt Lake). This year was the 23rd annual running of the event. 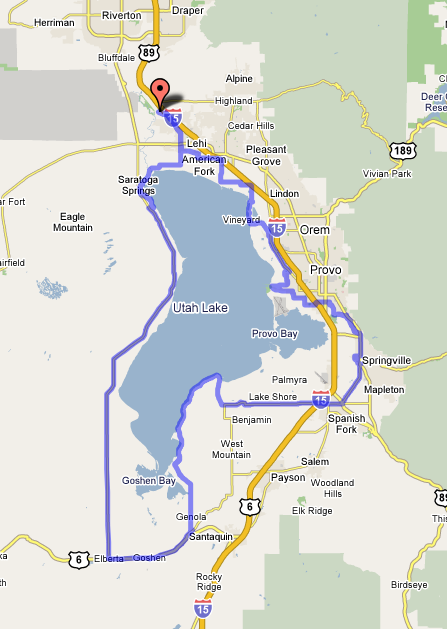 The ride started and ended at Thanksgiving Point in Lehi and went south on the east side of the lake and north on the west (clockwise). I took pictures while I rode and was posting them to Flickr and Facebook. Not sure if anyone besides my family was following along, but it was fun anyway. The hardest part of the ride was between miles 50 and 68. We were on the west side of West Mountain, the wind was blowing against us and we were riding uphill. Plus I really wanted lunch (which was at mile 68). I just threw in with some other riders in a pace line and we made it. In contrast, the west side of the lake was mostly downhill and the wind was at our backs. The sky was blue and I was happy. The best part was crossing the finish line with my family cheering me on. I'm tired, but feeling good.